Every woman feels anxious and excited during the pregnancy. They just want everything to be perfect and well-prepared for their unborn baby. Therefore, finding the best nursery idea is indispensable. 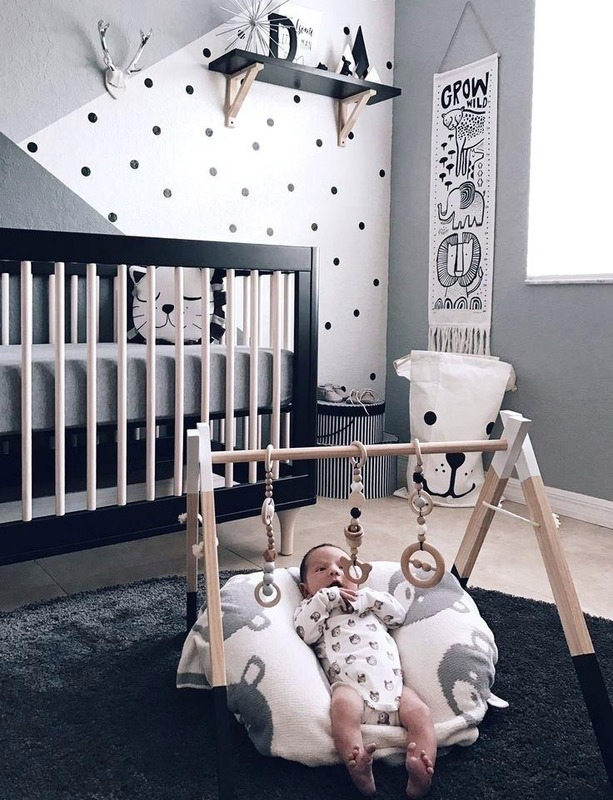 Check out these 10 gorgeous nursery ideas for boys that provide an ultimate comfort for you and your baby boy. Although he is still a baby, he deserves a theme room that every boy is dying for. When stepping into this room, you will be amazed with the simple yet adorable interior design. The combination of turquoise wall and ivory wainscoting adds a soft touch to the room. A brown wooden baby cot bed complements the wooden floor well. Three pictures denoting marine logos hang over the bed, creating a great focal point. Don’t let limited space hinder you from decorating your baby’s nursery. Investing on an all-in-one baby cot bed will be your safe bet. This baby cot bed is all you need to have a perfect nursery especially when space is the real issue. This bed features some built-in shelves that you can use to store your baby boy’s clothes and diapers. You will not need to purchase a changing table that might be pricey and take up a lot of space because it will make the room become more cramped. This bed has everything you need including a changing table on the shelves. It is such a top-notch bed that helps you salt away some money. Your baby boy’s nursery deserves a thorough decorating plan so that it will not end up becoming a hodgepodge of ideas. You can apply a certain interior design like vintage, rustic, or even minimalist. The minimalist design is clearly recognized from the use of white and black hues as well as the clear-cut furniture. And to maintain the simplicity which is the most prominent feature of a minimalist interior, you can keep the essential furniture only rather than cramming many things at once. A cute yet simple height poster hangs by the window, filling in the awkward space between the wall and window. It does not only adorn the room, but also helps you figure out and monitor your boy’s height. Soft color schemes have always looked great for a nursery because it provides a calmer feeling. Besides, soft colors like light blue are visually pleasing and elicit comfort. 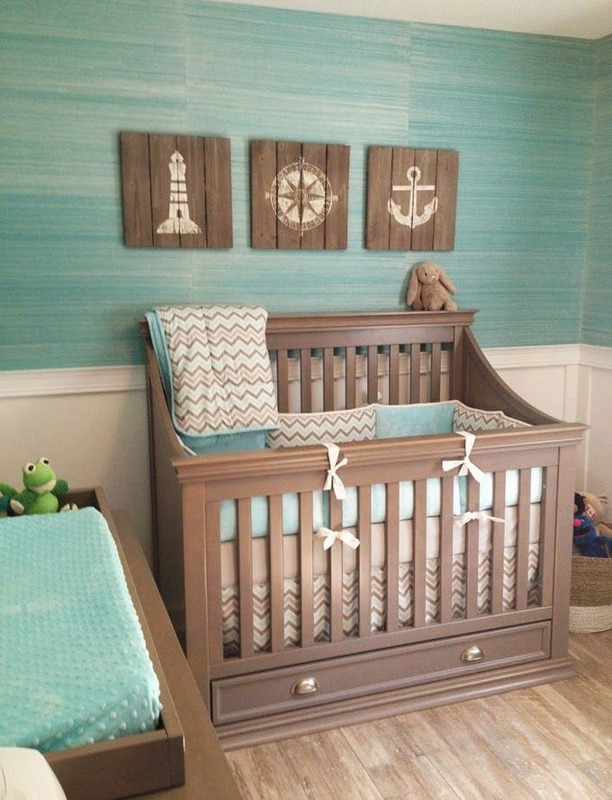 This nursery looks adorable with the light blue accent wall which is accentuated with a wooden calligraphy of your baby’s name, denoting whose room it really is. 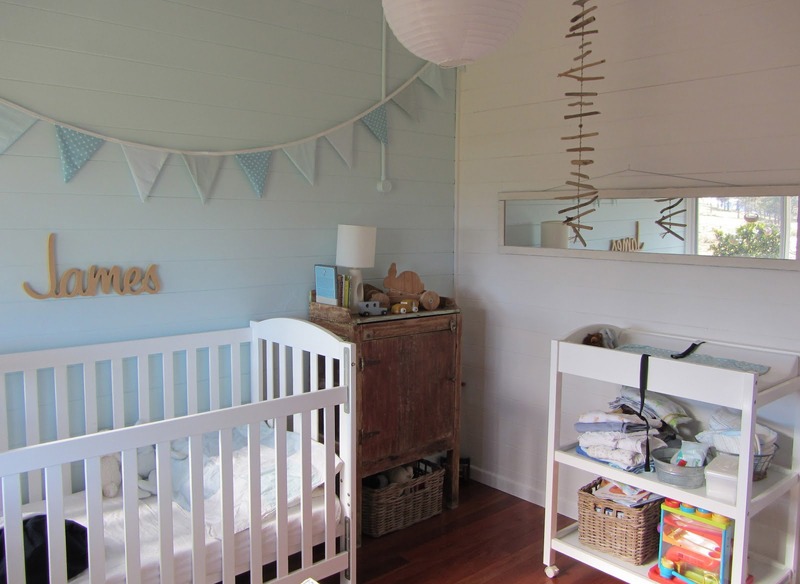 White furniture complements the light blue wall perfectly, and so does the changing table. But the most conspicuous furniture is the well-worn cupboard that sits at the corner of the room. It adds the touch of rustic look to the room which is surprisingly awesome. This forest is different from many other forests that tend to be dark and scary. No one will be able to restrain themselves from staying in this veritable forest with those cute giraffes and elephants. Thus, your baby boy is going to love taking a nap in this nursery. A comfortable beige carpet is tacked down to the floor, preventing your baby from getting cold and creating a safe haven for him. A nice black leather armchair sits by the window so that you can breastfeed your beloved baby boy comfortably. 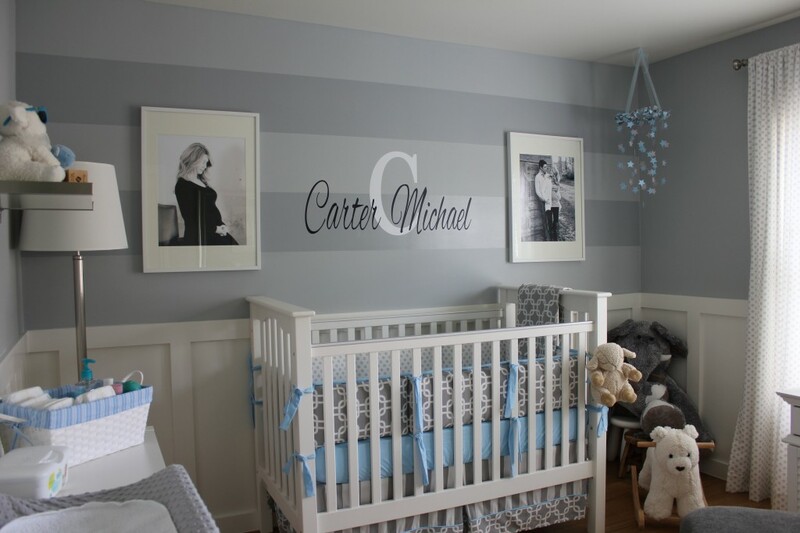 Calligraphy of the baby’s name is printed on the blue and gray wall which creates a nice centerpiece. 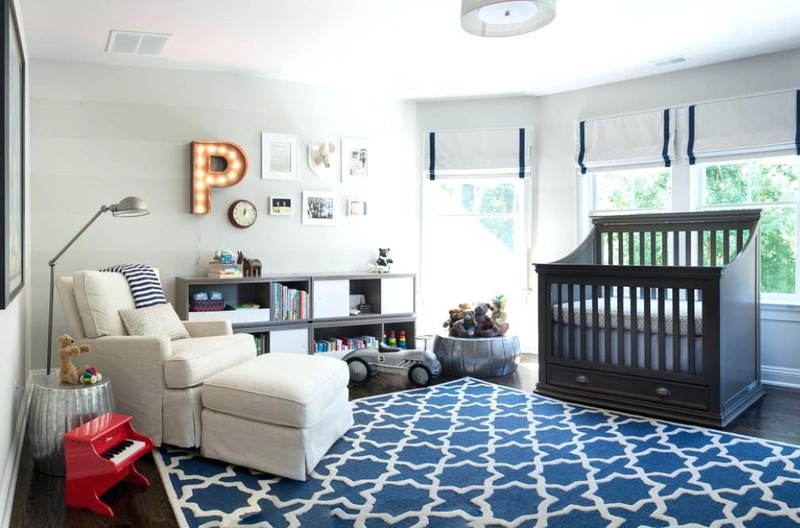 This nursery looks nice with gray hues and tints of blue and white, creating a relaxed ambience. The white baby cot bed complements the flat white wainscoting paneling very well. Two photographs of mommy and daddy make a great focal point as well as conjuring up the memories of when this wonderful story began. A baby changing mat perches on the white drawers so that you can change the baby’s diaper without breaking a sweat. This nursery is such a comfortable room for you and your son. 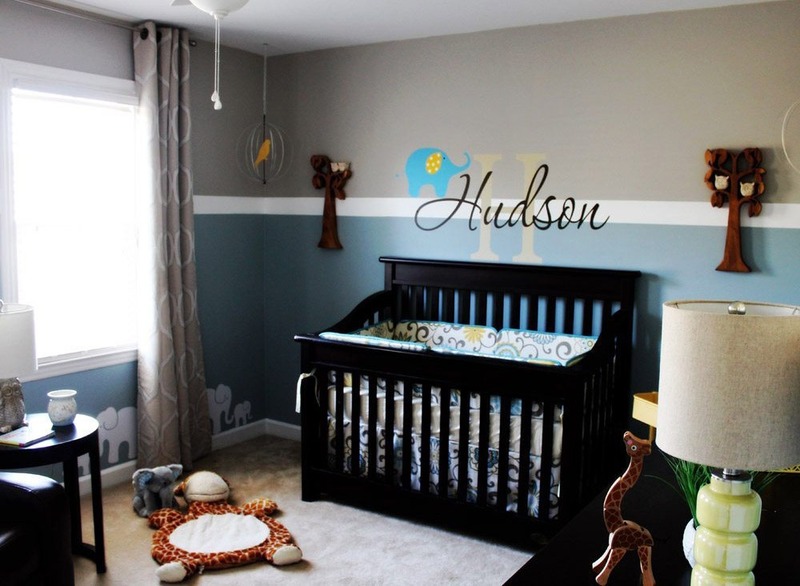 A white baby cot bed stands against the beige wall with your son’s name written on it, creating a perfect centerpiece. A navy-blue armchair sits by the window which provides a very comfy seat for you to nestle and feed your baby boy. A navy-blue ottoman is available for you to put your legs on so that you can breastfeed your son comfortably. Instead of investing on bulky drawers or cabinets, these white racks leaning against the wall will be the best choice for a room with a limited space. When stepping into this nursery, the images of rain forest are instantly conjured up by the use of green and brown hues. On the wooden floor lies a green rug which looks like moss. The light green baby cot bed stands by the window so that your baby can enjoy the fresh air and natural light. But make sure you keep the window closed to prevent your son from jumping out of it. A nook is available for you to lounge comfortably while feeding the baby. 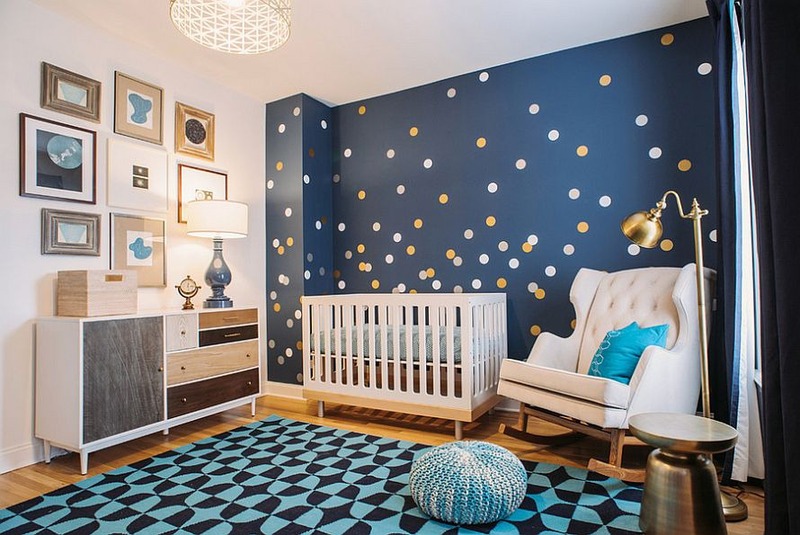 This nursery is inspired by the twinkling stars in the beautiful night sky. Some photographs hang on the wall above the cabinets, creating a gallery-like focal point. A rocking armchair helps you to sit back comfortably so that you can feed your son better. If you feel like to stretch your legs, just put them on the blue ottoman. Airy room is good for your son. And to achieve it, you can install many windows. Just make sure that you keep them closed as they can be harmful for your son. Gray cabinets stand against the wall, making sure that this room is clutter-free. Next to the cabinet is a bulky white armchair that enables you to curl up in it and feel snug. You can even stretch your legs out so that you feel more relaxed when breastfeeding. 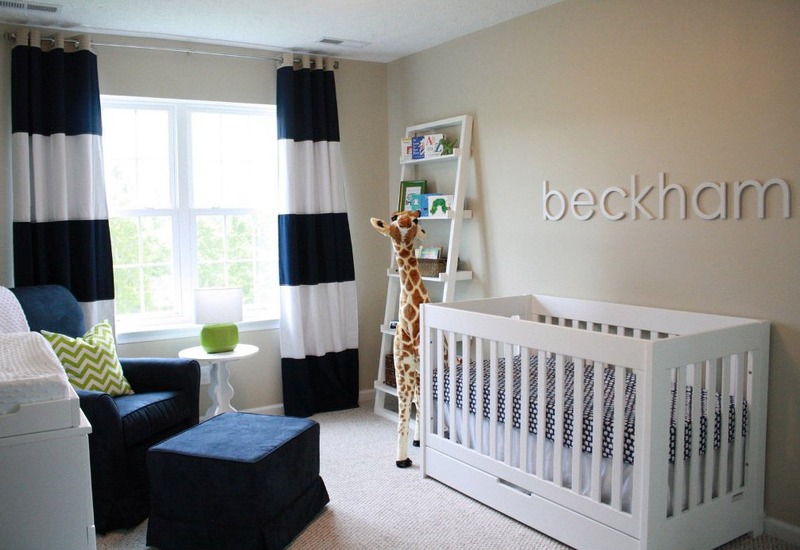 One thing for sure, creating gorgeous nursery ideas for boys is not only about the combination of color and furniture. Instead, it is also about a plenty of love that you give to your son.